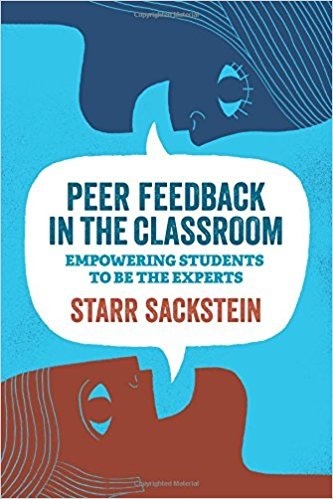 Peer Feedback in the Classroom: Empowering Students to be the Experts by Starr Sackstein tells the story of how she introduced peer feedback and all of its benefits into her classroom and how it can be applied in other subjects. If you try this, not only will your students develop knowledge and skills better, they will also learn vital collaboration and social skills. Buy one for your school now. Every student has the potential to be an expert in something. Step one is to get to know the students so you can identify and expand their strengths. This can allow the students to share their strengths, perspective, ideas, and preferences. This shows students that there is no one right way to learn or teach. Today it is common for students to know more about some topics than teachers do. This should be exciting as students can share expertise. Technology is an area where this often happens. The big idea here is to build trust and enthusiasm, which may not be easy and will take time. A key is to teach students self-advocacy. This will make it easier to address specific needs as students will bring them to you. This should start in kindergarten. This will also serve students throughout their lives. In short, students need to know when they need help and how to get it. Asking peers to help can be a great way to grow. Like all chapters, this one ends with reflection questions for teachers. Your initial focus is to develop a welcoming respectful learning environment that supports risk-taking and honest sharing. Students need to be comfortable sharing their work and gain confidence in providing feedback. You have to know your students if you are going to develop rapport so start by finding out what you can about their lives and outside interests as you share some of yourself. Respect can’t be assumed; it must be taught explicitly and modeled continuously. Starr suggests you use surveys to learn about students and provides some samples. Rituals and routines are essential to developing rapport. You don’t want to be too flexible and you must establish clear expectations. It might help to have students produce things that are intentionally inferior. They should feel safe correcting these items and see that it’s ok to be wrong. The teacher needs to model feedback intentionally so students can see what is expected. This will include praise and questions that should prompt students to think about how to improve their work. Be sure to share errors you have made. Once your rituals are in place you can give students more control as you facilitate from the side. Starr gives examples from her student newspaper class and another teacher’s fifth-grade class. Step one is to set clear goals and criteria for success. For each assignment, you need to ask is this worthy of feedback? Use questioning activities and discussions and connect work to prior and future learning. Align learning objectives with standards and the big picture of the lesson. Make sure students see exemplars so they know what mastery looks like, but not ones that are identical to the current assignment. Feedback needs to be specific, timely, and delivered in a way that works for the receiver. Focus on one or two points at a time. Rather than saying good job, let them know how they have improved their ability to do something specific. When you are critical, provide suggestions for how to improve something. Limit your feedback to the material covered. Avoid giving feedback too soon as you will end up owning the work yourself. Feedback from teachers should be private. Look for nonverbal cues as you give feedback and adjust your tone accordingly. If a student is shutting down say something encouraging and revisit the issue later. This entry was posted on Friday, November 10th, 2017 at 7:52 am	and is filed under Book Summaries, Education Books, Leadership Books. You can follow any responses to this entry through the RSS 2.0 feed. You can leave a response, or trackback from your own site.